In the last two articles on Samson, I made a very strong case that the life and times of the Israelite judge were orchestrated by God to foreshadow Christ, as a panoramic view of the Deliverer and Redeemer of Israel, from the sacrifice of the “Lion of Judah” to the Great Mystery of God during the Apocalypse. 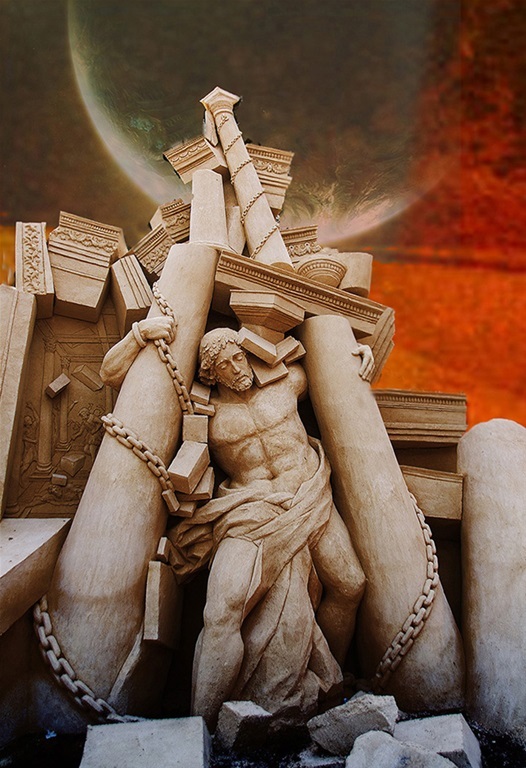 In this article, which is the last on Samson, we will consider how Samson brought down the house of Philistine lords and elites as it relates to the coming Divine judgment on unfaithful nations of former Christendom. When God led Samson to take a Gentile wife, it was- according to Scripture- for an occasion to bring judgment on the Philistines. Likewise, for the unfaithful churches and worldly who have forsaken the Word of God for personal pleasure, prosperity, and indifference, or to simply go their own way apart from Him, God will bring a similar judgment. With these prophetic portents in mind, we will now consider a mysterious harlot followed by the story of Samson and Delilah in the Book of Judges, Chapter 16. 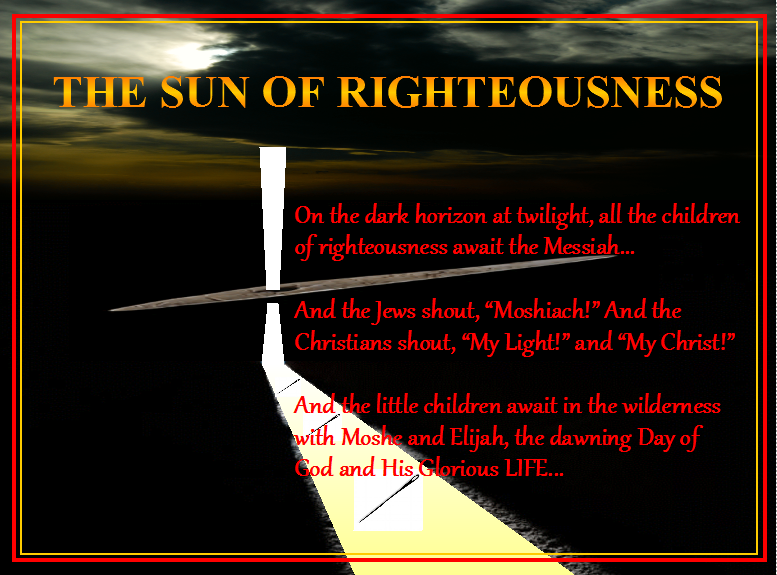 In this Divinely orchestrated parable, Samson (meaning, sun-like/sunlight) again foreshadows the Sun of Righteousness– the awaited Messiah and“Light of the world” (see Mal. 4). The harlot’s house that Samson entered (not to be confused with Delilah’s house) symbolizes Judea in the 1st century A.D. which- for the most part- was not faithful to YHVH their God. The priesthood largely consisted of political prostitutes who appeased the Roman Empire for wealth and clerical power. They utilized the Temple sacrifices for profit which angered Christ (as when He overturned the moneychangers’ tables). The first, unnamed harlot in this similitude leads us to more insight with the second harlot, Delilah, who seems to represents Christians as well as Jews who have betrayed Christ for worldly wealth and security, beginning with Judas Iscariot. Judah, according to the prophecies, was the “strong” tribe that Gaza appears to symbolize in the story, much like a lion (see Gen. 49:9-10), and in Judea (a.k.a. 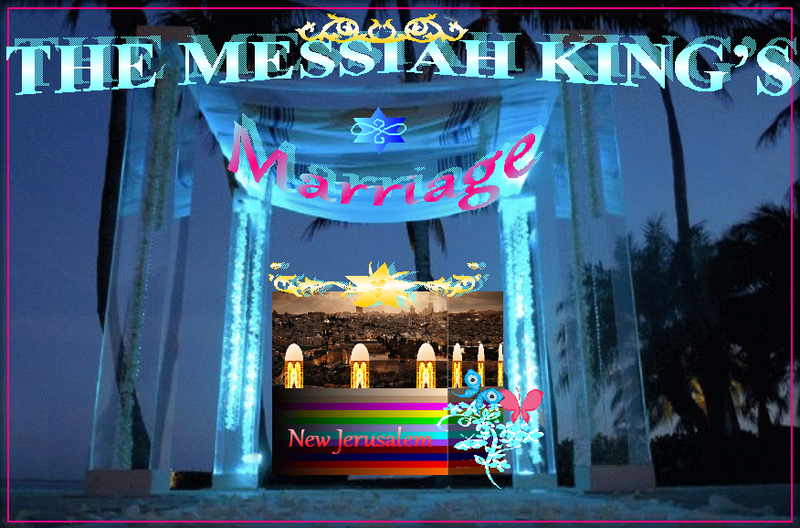 the House of Judah) there would be kings/leaders and priests until the first arrival of Messiah (Shiloh). Likewise, the Roman Empire was also the strongest empire to rule over Israel (see Dan. 7:7). Hence, we find a mixed culture and dual prophetic revelations that fit Judea and the surrounding region in the first century of the Common Era, where Gaza (in this story) can symbolize both Gentiles and Jews. What is most prophetically clear from the passage above is that there was an excited and dreadful announcement that the Messiah- the true Judge of Israel- had arrived, followed by a nocturnal plot to capture and destroy Him. These correlations are somewhat simple to discern when we consider how Judas plotted with the priesthood (kohanim) to betray Christ in the darkness of night (i.e., in the Garden of Gethsemane), to turn him over to the Romans at dawn (cf. Matt. 26:16; 36-57; Mark 11:18; 12:12; 14:1; Luke 20:19; 22:2-6; John 7:1-30; 10:39). Hence, the foreshadowing betrayal of Samson involves both Jews and Gentiles. As we continue will parallels of Samson to Messiah, it appears as if two very different paths were taken by Samson and Christ on how they dealt with those plotting their assassination. However, they differ only superficially, as we shall soon see, for to God the sacrifice of Christ for the people was indeed a victory like Samson’s battles. Clearly the symbolism of Samson carrying the city doors on his shoulders, up the hill, is similar to Christ carrying the cross on His shoulders up the hill of Golgotha. But why the doors, you ask? Christ is the “Door of the sheep” for entering the mysteries of God, and city doors look to His inheritance of the Kingdom when Jerusalem becomes the city of His throne. Interesting to note, the first harlot in the story of Samson (after the Philistine bride’s betrayal) may not have been the one to betray Samson, for we are not privy to exactly who went and informed Gentiles fighters of Gaza that Samson was lodging in her house. Rather, the plot or scheme appears to involve a few people- not a collective representation of the entire nation of Jews (House of Judah). 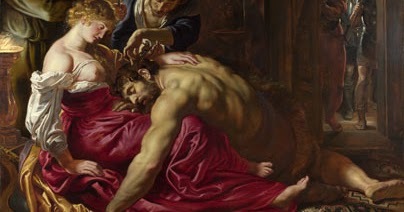 On the other hand, as we shall see, Delilah deliberately betrayed Samson, for she wanted immediate blessings of worldly wealth (i.e., silver) and to know of his secret strength; hence, we find a very subtle transition from an innocent harlot (as far as betrayal) to a follower of Christ who betrayed Him to Romans. Here, again, we discern people during the time of Christ, specifically the priesthood and scribes beholden to Roman rule. As Christ said, He is the Vine and we “are the branches,” which means that we share in the Word of God that gives life, like a spreading plant; the branches that do not abide in Him and His Word will be given to destruction (see John 15:5). Samson loving a woman in the Valley of Sorek symbolizes Christ’s love for His meek (i.e., the valley) believers who share in God’s Word. Many of Christ’s followers were dispirited at the time of His arrival in Judea, disheartened and defeated under harsh Roman oppression; whatever the Romans asked of the priests, they did, and perhaps this contributed to Judas’ betrayal of his Messiah and not abiding in Him. The priesthood was essentially an extension of Roman authority over Judea, and the fame of Christ upset many of them. As alluded to in the passage above, several times the scribes and priests sought how they might take Christ, for they did not discern that His strength was actually from their God. Some of them claimed that His power was of “Beelzebub” and devils. Thus, many religious leaders continuously tested Christ to find an opportunity to seize Him. Judas would ultimately prove to be their means of accomplishing it. Delilah wanted to know where Samson’s miraculous strength was derived, only for a much more practical reason than religion: money. Just as Judas betrayed Christ for silver, Delilah was promised the same prize if she could find a way to betray Samson to the Gentile enemies of Israel. It is not explained in the book why they decided upon eleven hundred pieces of silver, but it appears to be God’s way of suggesting Judas’ desire for the money collected by the eleven other apostles. Indeed, he was in charge of the ministry funds and resented when/how they spent it (see John 12:5-8). Judas, concerned more about money than the things of God, was like the religious moneychangers at the Temple, and Delilah, the dispirited, exemplifies that betrayal of the Spirit of God for the riches of man. Notice also that the Philistines claimed that they wanted to “afflict” Samson, which left room for Delilah to deny that she was turning him over to murderers. The same appears to be the case of Judas Iscariot, who hung himself in guilt after the Romans killed Christ. Nonetheless, it was written beforehand that Christ would be both “afflicted” and killed for the transgressions of His people (see Isa. 53)- something that Prophet Isaiah called “the sins of my people.” And Prophet Hosea agrees that “He was stricken, but He will bind us up,” meaning that the people would receive spiritual healing after they accepted His self-sacrifice (see Hos. 6:1). After Delilah agreed to betray Samson to the Philistines for silver, she engaged in a series of three failed attempts to bind him by his confessed weaknesses, and by the fourth time his soul was troubled to the point of death; hence, he told her that only if his head was shaved- breaking his parents’ Nazirite vow- would the Spirit of God leave him. The first fail was binding Samson with “seven fresh bowstrings,” which he broke when she cried of the Philistines coming (Judg. 16:6-9). The second failed binding was with “new ropes that have never been worked,” but his secret was kept (16:10-12). The third fail was when she wove the seven locks of his hair into the “web of a loon,” which he broke free of when she cried that the Philistines were coming. Astoundingly, when Delilah finally learned that his strength was from the Spirit of God, she was not phased in her attempts to betray him, for by then, after three times, she felt mocked and deceived, which made her more determined than ever to manipulate and scheme. Samson apparently loved Delilah blindly to trust her with his greatest secret, and for his trust he was led like a sheep to the slaughterhouse. Perhaps being like Christ, he knew, but being grieved to the point of death (see Mark 14:34) made him susceptible to his fate. As the Lord Yeshua said, there is nothing hidden that would not be revealed; we need only ask, seek, knock, and remain persistent to discern the mysteries of the Scriptures. In a previous article on Elisha and a prominent woman of Israel’s resurrected son, I explained that her promised child, who died on her knees during harvest season (see 2 Kin. 4:20), foreshadowed Christ dying among Jews on the hills of Moriah, specifically at Golgotha (called Calvary). Delilah “began to torment” Samson when he was asleep on her knees, which looks to the crucifixion of the Suffering Servant Messiah. But what does hair mean in prophetic symbolism? If Christ is the Head of a Body of Believers, then hair that grows out of the Head must symbolize His bound flocks- the people who come forth from the mind of Christ. Delilah had his seven locks shaved off, which represents a separation from His people. When Christ was betrayed, the sheep were scattered, fulfilling the prophecies, and then He fell weak and was tortured to death. His strength was from God, but the Spirit does not dwell where there is no belief in His works by the people. 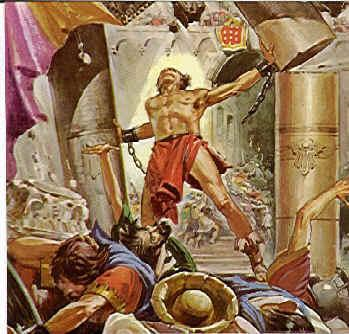 Christ was taken from a few hours of imprisonment among the priests to the Romans for scourging and crucifixion after dawn, fulfilling the prophecies, but Samson taken to a prison (or dungeon) more precisely alludes to Christ going to the prison of the dead to preach the Gospel before He was resurrected (see 1 Pet. 3:18-20; 4:6). The bronze fetters suggest being bound to the Greeks (study the empires-image of King Nebuchadnezzar), which Romans were called by first century Jews, because they had inherited Greek philosophy and culture (i.e., hellenization). Greeks generally meant Gentiles, and Delilah selling Samson to the Philistines looks to Christ being sold and bound to the Gentiles. As for his eyes being bored out, this fact looks to the deaths of the prophets- the “seers,” as they were called in ancient times. Besides Christ, it alludes to the end of the nation of seers which came within a generation of the cross. And this blindness may infer more for the end of the age, depending upon how Scriptures are interpreted. The story of Samson is a story of miraculous victory after defeat: a victory that came against overwhelming odds and opposition from both his friends and foes. Samson’s countrymen turned him over to their enemies, the Philistines, rather than killing him themselves (see Judg. 15:13), and they did so for the sake of peace with their oppressors. Of course, this was delusional on their part, and still Samson prevailed. Samson’s own lover sold him for silver, but, as we shall see, he gained the final victory over his persistent enemies. All these things foreshadow Christ being delivered into the hands of the Romans for a false sense of national security- to save the Judean nation which afterwards fell to the Romans within a generation of the crucifixion. Samson’s people thought that betraying their judge and deliverer was the answer to their problems, although they were actually betraying God (and His Spirit within Samson) to do what seemed right in their own eyes. Meanwhile, his many Gentile enemies thought that ultimate victory belonged to them (if they could just kill that one Jewish troublemaker) and that their pagan deity had finally brought them victory. Dagon, meaning grain, was a male Philistine deity, a human-fish hybrid and leading god of war and fertility in their pantheon. The Philistines’ praise for their fish-man false deity was in stark contrast to Israel’s history of doubting and seeking to undermine their true God, Elohim YHVH. This truth was mirrored over a millennium later when the Roman pagans celebrated battle victory after victory in praise for their deities (e.g. Zeus/Jupiter, Apollo), while the leaders of Judea betrayed their true Deliver and Judge- the Suffering Servant Messiah– to the Romans in the name of securing national peace. The Romans rewarded the nation that had sacrificed so much by renaming Judea and the land of Israel after their ancient Philistine enemies, Palestinia. They destroyed Jerusalem and the Temple c. 70 A.D. and put down the final Jewish revolt c. 135 A.D. to expel Jews from the region and scatter them into their long Diaspora. Thus, the fish deity represents the nations of the sea– the Gentiles- receiving Christ since the time of the cross and their festive mixing of pagan religions with Christian/New Covenant doctrine. 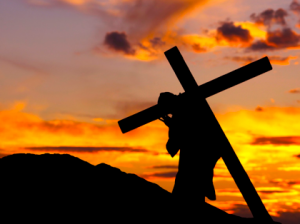 Rome, which crucified Christ and destroyed God’s holy city and Temple, became Christian. The Philistine feast of lords is a similitude of the Passover feast in Jerusalem when Christ was paraded by Pilate and Roman authorities, mocked, scourged, and blasphemed at the cross by their soldiers. Yet this mockery before Gentile elites and lords also looks to a long history of Christ being mocked by pagans and secularists throughout the nations as the Gospel spread around the world. Indeed, the pagans make sport of Him and Scriptures to this day. If not for the excerpt that “he had done no violence,” the messianic passage of Isaiah could easily be mistaken for a tribute to Samson or some other Israelite warrior, but the point of the passage is that Christ fought spiritual battles for hearts and minds, not to merely destroy his enemies. Grace came to Israel and Gentile believers through Christ’s sacrifice. First came the sacrifice of God for all who would believe, for all nations of the world. Nevertheless, there is an end to this Age of Grace, and Scriptures of both the Old Testament and New Testament warn that the Messiah is coming to destroy His enemies, to bring vengeance as He saves, restores, and resurrects His elect. Like the Philistines when they made merry, Gentile nations have been able to rejoice as long as they had Christ in their house- Him suffering while they celebrated victory. And, like the Philistines, many do not expect His coming sudden judgment on the wicked world. The Roman House- the priesthood of Babylon- will be destroyed along with conspiring national leaders who scheme for a one world utopia under socialist fascism. The end of Samson foretells this judgment of God on the nations, as have all the biblical prophets. Recall that earlier I compared Samson’s eyes to prophets who were called “seers” in ancient times. Before the Lord Messiah takes His vengeance on the Euro-Muslim alliance (the Beast and False Prophet), first His two prophets (also called His “two witnesses”) will be killed in Jerusalem for testifying to His truths. Their vision of what is to come will not abide well with the rebellious lords of the world, and the two will be snuffed-out by the Antichrist and his troops as the renegade elites celebrates their deaths (see Rev. 11:9-10). Then our awaited Savior, the “King of Kings and Lord of Lords,” will exact His recompense upon all His enemies- taking vengeance on all those who have made mockery of the cross and gone their own ways. Moreover, Christ was also delivered to pagans to save the lives of his countrymen (John 11:50), and Judas conspired with the priests for silver (Matt. 27:3) to carry it out. He was the Head separated from the locks- from the flocks- and was mocked unto death for our deliverance (see Luke 23:36). And like Samson, Christ will bring down the great house of Gentile lords because of His self-sacrifice. In correlation to the story of Samson, He could not be bound, for His only weakness was in the loss of His people (cf. Judg. 16:13). He was weakened unto death for the elect of seven millennial days, to provide a means of atonement and redemption. Like Samson, after three times (three years) of the Beast severely persecuting the saints, on the seventh year of the Apocalypse, on the third millennial day since the cross, his great mystery will be revealed (cf. Judg. 16:15; Rev. 13:5-7) to the world. As for the 3,000 people slain of the Philistines, 3,000 years are determined to bring the entire world into submission to God, and the Great Sabbath is the third millennial day from the cross. Then even death will be done away with at the G.W.T.J. There are two great pillars that support the spiritual Temple of Seven Heavens (making a Temple of souls, of living stones, from seven millennial days via the works of Messiah). These two are on both sides of the fourth day (with the cross as central pillar); they are the Old Testament and the New Testament. Judgment comes to Jews and Gentiles through these two covenant with the people. However, like the story of Samson, they also bring deliverance for His people from oppression. At the Temple in Jerusalem there were two, great pillars before it was destroyed, so the message appears to be that the things of God that have fallen into Gentile hands will require a like judgment. God’s people will be gathered from all nations and saved in the end. For the elect who are raised and being raised to reign with Christ, there is a promise of a new and everlasting age of restoration, justice, joy, and peace. In that day, the Temple of God will be the only temple that stands, as the Lord has said: “He who overcomes I will make a pillar in the Temple of My GOD.” All pagan houses of worship and festivities will fall, be it they claim to have Christ in their house or not. Further, it matters not how many dignitaries and elites attend any house; every mountain will come crashing down when God lifts His meek valleys for the return of the King. In conclusion to these things, Christ today is mocked, and the enemies of God tell His seers not to see and His preachers not to preach, but we will have the ultimate victory through His sacrifice. He is “the Way” to our Great Sabbath. Judgment “begins with the House of God,” and vengeance comes to the entire rebellious world; yet peace comes with a new day in a better world at the dawning light of the Sun of Righteousness.